Parents want their child to have every opportunity to learn and achieve their potential. It’s said that education and learning are the keys to success. So what does nutrition have to do with it? Over the last 40 years, numerous studies have been conducted around the world to demonstrate a correlation between a child’s diet and their intellectual, physical, and social development. Dr. Schauss, senior co-author of the landmark book, “Feed My Brain: Eating to Excel,” outlines a 12-week nutrition plan whose components have been shown in one of the largest nutrition studies in the world to maximize the academic performance of youngsters at all grade levels. The book is based on a study Dr. Schauss was involved in that was performed from 1979 to 1983 in the New York City public school system, which included nearly a million elementary-, middle-, and high school-aged students attending 803 different schools. In 1979, experts revamped the food program by reducing refined sugars, artificial colors and flavors, and food preservatives that were served in school breakfast and/or lunch, and by ensuring that students received the Recommended Daily Allowances (RDA) of vitamins and minerals which are need by the brain to help students learn. By 1983, according to a university that monitored the study, these dietary changes contributed to one of the largest gains in standardized test scores in American history! Using the same diet changes, similar results were reported by other school districts. Since the book was published, Dr. Schauss has been asked repeatedly if a dietary supplementcould be developed to meet the nutritional needs cited in the book. Given the compelling evidence today of the importance of nutrition on brain function and pilot controlled clinical trial studies using supplements performed around the world, Dr. Schauss partnered with Trace Minerals Research to manufacture his exclusive formulation served in a delicious chewable wafer. The result? FMB! One of the key parts to FMB goes against the idea that more is better. When it comes to a child’s nutrition, the research shows that more isn’t necessarily better. Over-supplementing can exceed the body’s ability to utilize the nutrients taken, particularly by the brain, which regulates the intake of nutrients needed by the brain, in part, through the blood brain barrier. 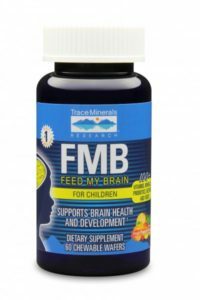 Controlled clinical trials using the lower dosages of nutrients found in FMB have demonstrated that the optimal range of a nutrient’s Percent Daily Value(DV) can vary between a range of 25 to 100 percent, depending on the nutrient. This range approximates the levels of these nutrients found in the diet served in the school system study that was attributed to the dramatic gains seen in standardized academic test scores at all grade levels. How may FMB help a child’s ability to excel?